Over the past few years, we have seen a great number of blockchain token-based platforms emerge in an attempt to penetrate the video-games market. This is not surprising according to data from UK trade body ‘Ukie’ (or ‘The Association for United Kingdom Interactive Entertainment’): which shows the latter remaining highly lucrative, yet competitive. These statistics show the global market for video games being expected to grow by 13.3% to $137.9 billion this year. 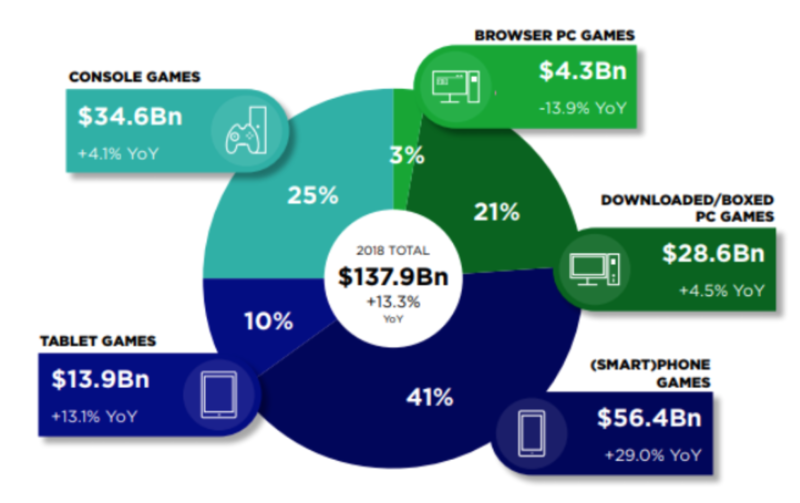 Revenue from mobile-phone based video-games in particular "will be the largest segment of the global games market, representing over half of the total global revenues for the first time." For the most part, cryptocurrencies have been far less fortunate over 2018. Total market capitalization has been in steady decline since a peak in January 2018 which falls in line with the decrease in value which have been seen by the top coins, such as bitcoin and ethereum. These tokens are amongst those to have suffered the greatest losses (in both value and market-cap), especially over the past week and a half – when the market suffered what some have referred to as a "crypto market crash." Many medium and smaller cap coins by comparison have fared better at weathering the storm. MobileGO blockchain based platform that utilizes its own ‘MGO’ which seeks to become "a universal token" for the global population of video-game players. The company was founded by Sergey Sholom, Ph.D. (Founder and CEO of MobileGO and Datcroft Games, the latter in 2004) whose prior achievements include having been a championship level gamer as well as creating large-scale tournaments in Russia for the classic PC game Quake. At Datcroft, Sholom is responsible for over 100 employees. MGO is an Ethereum based ERC-20 and ERC-223 token. In total, there has been a fixed-maximum of 100 million MobileGO tokens: 70 million of which distributed to crowd sale participants whilst 30 million were retained for business affairs. Regarding funding distribution: a "minimum 50%" is said in the whitepaper to be invested "towards direct marketing for gamer installs." Twenty percents will go towards the development of the "decentralized virtual marketplace, decentralized gamer vs. gamer match wagering, and decentralized tournament environment” whilst up to 30% is going to be retained for “legal, payment processing float, [and] future development." Early October 2018, MobileGO and payments processor Xsolla announced their decision to go into partnership together. Xsolla will incorporate the MGO token as a permanent new payment method onto its platform/ecosystem. For developers: it means a greater level of compensation from the sale of their products and in-app purchases, including the ability to receive royalties immediately via MGO. It also comes with confirmation of a long list of games for the platform featured on the MobileGO website. These include titles such as Champions Online, Bard’s Tale IV, Age of Wushu, Black Shot Global, Assassin’s Creed Odyssey, Hero Wars, Heroes Journey and Super Animal Royale. Xsolla is a private company and as such we do not have access to public stock records as such, however, we can determine the success and potential which forming a relationship with such a company can provide. It appears to be a fairly large company, with at least three offices located across Russia, Serbia and the USA. MobileGO proposes a menagerie of fully-fledged solutions when it comes to the company’s USP (unique selling point) of blockchain-added-benefits for e-sports and multiplayer gaming. Firstly, gamers can create a blockchain secured and cryptographically encrypted profile account (much like Steam or Xbox Live) which is updated based on their portfolio of played games, referrals, reputation scores from other players, and more. This profile will be periodically reviewed, with rewards being distributed for in-game purchases and achievements – whilst ownership in-itself will result in access to "free entrance into VIP gaming tournaments with prizes" and private beta tests of pre-release video-games. When referring to live tournaments featuring real money, the white paper simply likens its plan as to "duplicate the success that BigPoint had in the PC/Web gaming market," – another company which MobileGO has partnered with. This ambiguity of this section is not promising. Decentralized tournaments are explored in more detail. They "will be set up and run by users of the platform who have MobileGo tokens" – which will act as the sole form of currency in the tournament ecosystem. Smart contracts are to feature heavily in the execution of these events which can all be managed with the one app provided by MobileGO. Beyond centralized tournaments (which feature similar stipulations to their decentralized brethren), a ‘decentralized virtual marketplace’ is the final core feature to be discussed. It will "will allow gamers to trade virtual items from mobile games directly with each other using MobileGo tokens… on the Ethereum blockchain." By looking at data from CoinMarketCap we can see that whilst it has faced similar woes to its parent chain (although it is also a dual chain solution) Ethereum over the past week – it has overall been enjoying steady and natural growth of value. After several months of decline, the token value has increased considerably since the beginning of October and is ranked at 92 at the time of writing placing it in the ‘top 100 cryptocurrencies by market capitalization’. MobileGO and their MGO token are ones to watch right now in the crypto space, defying the negative trends witnessed by many about the market since the first crypto crash back in early 2018. As a technical, cryptocurrency and video-games enthusiast, this project has an inherent appeal which drew my attention to them in the first place. Whilst in severe need of an update, the white paper acts as a strong representation of the aims and goals of the team. MGO is currently available on several exchanges of varying size. It is compatible with Coinomi, MyEtherWallet and Jaxx wallets.